SUBHEAD: For American food security tell Trump oppose consolidation of corporate seed monopoly. Image above: Illustration of Bayer-Monsanto merger. From following article below. President-elect Trump recently sat down with Bayer CEO Werner Baumann and Monsanto CEO Hugh Grant at Trump Tower and had a “productive meeting” on “the future of the agriculture industry” and the pending merger between the two companies. Trump has heard from the CEOs. Now we need you to make your voice heard. Add your name and tell President-elect Trump: NO to the dangerous Bayer-Monsanto merger! To send a message to Trump on this issue click on the link below. I am a planner and architect living on Kauai in Hawaii. We are at the epicenter of experimental pesticide development. These pesticides have a synergistic interaction with GMO plants. Most of the major GMO Big Ag companies are here: Dow, DuPont, Syngenta, Monsanto, Pioneer, BASF, Dekalb. In Hanapepe Valley, where I live, we have Dekalb. In 1998 Monsanto bought Dekalb. Now Dupont owns Pioneer, Dow joined DuPont just recently. The larger these companies have gotten, the worse their effect on the island has been. Their money and muscle have made them more audacious. Our county government enacted an ordinance requiring a few hundred foot buffer zone between experimental fields and such land uses as schools and residential areas. However, the big corporate lawyers came in and pushed back hard. The companies bought our off politicians and took over our County Council. Experimental GMO fields are here for a reason. Besides the sunny weather and access to water there is a more important feature to Kauai. If something dreadful happens in a GMO field we are the most isolated land mass in the United States. We are expendable... lab rats. Stop the corporate mergers of pesticide/chemical companies who are ruining farmland and food quality to provide GMO junk food and addictive high-fructose-corn-syrup. Foreign takeovers of critical American industries are ill advised... especially when they are in industries crucial to our survival - like providing our food. The Chinese have recently taken over Syngenta. Syngenta's fields surround the Pacific Missile Range Facility where crucial US weapon development tests are performed. Bayer is a German company that produced the brand Heroin as a cough suppressor. They became part of IG Farben, a company that developed Zyclon-B, the poisonous gas used by Nazi Germany to exterminate non-Aryans. Monsanto's has its own ghosts in the attic. It is a monstrous corporation with its Hawaiian headquarters on Maui adjacent to the high-tech supercomputer telecommunications center in Kihei. Food security is as important as military security. We need resilience, flexibility, sustainability and variety to maintain food security. The goal of the big chemical/pesticide corporations is to make farmers developing their own seeds illegal. Let's get back to real farming in America before all the water and soil are washed away. I am very concerned about the ongoing consolidation trends in the seed sector and urge you to reject the merger between Monsanto and Bayer. Giving a foreign-owned, Bayer-Monsanto mega-corporation, unchecked power over what goes into our food supply is downright dangerous. Even Bruce Rastetter is against the deal, saying it would limit competition, raise costs for farmers, and stunt job growth. SUBHEAD: White paper from two former Justice Department officials warns merger would violate antitrust laws and lessen competition. A new legal opinion penned by two former Justice Department officials bolsters warnings that the proposed merger between agroindustrial giants Bayer and Monsanto "is a five-alarm threat to our food supply and to farmers around the world." Increase concentration in already concentrated industries for genetic traits, seed, and herbicides. For example, Bayer-Monsanto post-merger would account for approximately 70 percent of the U.S. acreage for cotton, with similar or higher shares in different regions of the U.S.
Increase Monsanto's already significant market power and increase its dominance in herbicides and genetic traits for seed. Eliminate not only the direct competition between Bayer and Monsanto for traits, herbicide, and crop seed, but also the head-to-head competition in agricultural biotechnology innovation markets and reduce opportunities for pro-competitive research and development (R&D) collaborations. Likely lead to higher input prices, less choice and higher food prices for consumers, including fewer non-biotechnology options available to farmers and consumers. Indeed, Stucke and Grunes write that given their findings, "the antitrust enforcers must not allow this merger to proceed." In July, Monsanto rejected Bayer's $64 billion takeover offer as "financially inadequate," but said it was open to continued negotiations. And this week, Bayer's second-quarter figures—which revealed a weak crop sciences division—were seen by some as "justification for the acquisition." But nothing justifies a "five-alarm threat to our food supply and to farmers around the world," declared Anne Isakowitsch, senior campaigner with global consumer watchdog SumOfUs, which publicly released the legal opinion on Wednesday. "This new mega corporation would be the world's biggest seed maker and pesticide company," she said, "defying important antitrust protections, giving it unacceptable control over critical aspects of our food supply—undermining consumer choice and the freedom and stability of farmers worldwide." That opinion is widely shared by food safety advocates as well as the more than 500,000 people who have signed onto a petition opposing the deal. Many have observed that the Bayer-Monsanto deal is just one of several Big Ag mega-mergers—along with those between Dow and DuPont and ChemChina and Syngenta—that "already threaten to hyper-consolidate the biotech seed industry," as Food & Water Watch executive director Wenonah Hauter said in May. 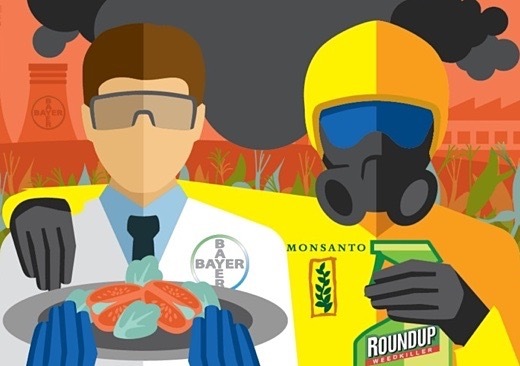 "The shocking consolidation in the biotech seed and agrochemical industry turns over the food system to a cabal of chemical companies that would make it even harder for farmers, consumers and communities to build a vibrant, sustainable food system," she said at the time.